Earlier this year we were thrilled to receive a copy of Jane’s book in which she explores the ways in which people with learning difficulties can engage with music in as many different ways as many of us take for granted. This is just the kind of thing we’re in to at Stay Up Late and so it was lovely for our work (and the work of Heavy Load) to be referred to in the book. As Jane points out in the book, music pervades everything in our lives and so she concentrates on using music as a means to enable people labelled as having learning disabilities to be meaningfully involved in experiencing and enjoying music. In writing the book she’s worked with a group of learning disabled musicians going by the name of the LA Buskers and their tracks are downloadable as additional resources. Jane has written the book as a practical guide and it contains load of tips, resources and ready-to-use lesson plans as well as case studies. 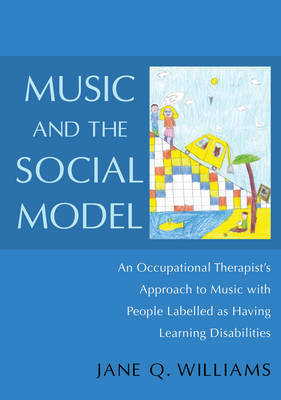 This is an inspiring and practical guide that we’re sure would be of real interest to Occupational Therapists, anyone working in day centres, social care settings and community music projects. It also challenges us all to think about the opportunities that people should be able to enjoy around music, whether it’s performance or as a member of the audience. Jane is a qualified Occupational Therapist practicing in Devon and since December 2007 she has worked as a freelance music facilitator and music teacher.